CHEF – DOES YOUR RESTAURANT TELL A STORY? There are over 980,000 freestanding restaurants in the United States. This does not include business and industry operations that service offices, plants, hospitals and schools. Do the math: that’s one restaurant for every 300 people in the United States. While this number alone is impressive, what is even more noteworthy is that the number is in a constant state of flux. A significant number of these restaurants close within the first year of operation and many others follow suit within the first five. Fortunately, as some restaurants close, others open to take their place. What sets your restaurant apart from the pack? How are you able to beat the odds and demonstrate short and long-term success? There are certainly many answers to this question, from location to cost controls, from product quality to service, and from team selection to understanding competition. However, there is another, sometimes overlooked key to ensuring that your operation stays out of the “commodity restaurant” silo. Commodity restaurants are not unique, they provide a simple product that is easy to compete with, and rarely attract return clientele. The primary objective of these operations is to exchange food for money. So, how do you avoid “commodity” classification? Aside from location, cost controls, staffing, pricing and consistent product, the restaurants that have staying power are those that have a story and tell it through the physical plant, the product, the level of service, and the marketing efforts used. So…what is your story? Keep in mind that running a restaurant is akin to theater. Each night we set the stage for another performance that includes interaction with the audience while appealing to all of their natural senses. A well-orchestrated play is engaging, full of pleasant surprises, and stimulating to the point where those who attend are still talking about it days after the experience. It is this end result that every restaurateur is after. When the theater is right, when the story is consistently upheld throughout the experience, then every participant becomes a willing ambassador, a person who will return and convince others to do the same. KNOW THE AREA YOU ARE IN: What is the history of the city or town, the neighborhood, the prominent people who spent time there, as well as the past, present and future of the community? All of these factors can serve as a foundation for your storyline. RESEARCH THE HISTORY OF THE BUILDING THAT SERVES AS HOME FOR THE RESTAURANT: When was it built, who was the architect and builder, who lived there or what businesses were part of its past, and what did it look like in a past life? “If these walls could talk”, should be a part of your story that might very well influence your décor, menu style, uniforms, menu items, cooking methods, and certainly the name of the restaurant. The operation should “talk” to the guest and provide the tools for your staff to continue to weave the story. WHAT WERE THE ETHNIC INFLUENCES WITHIN THE RESTAURANT’S NEIGHBORHOOD: Every community has a story to tell and much of it will revolve around what its inhabitants brought to the dinner table. Build your menu concept from this. WHAT ARE THE MYSTERIES THAT ARE PROTECTED BY THE COMMUNITY: It might be a person of fame, an event that stands out, a crime that was never solved, or a question that no one has found the answer to – dig into the past and find that grain of intrigue that is worthy of the restaurant’s storyline. IF THE AREA IS VOID OF ANY INTERESTING STORIES, THEN BRING YOUR OWN: Tell the tale of your family, your friends, your career, or your life-experiences. There is something deep in everyone’s past or future that can be developed into great theater. IF ALL ELSE FAILS, MAKE IT UP: In the rare instance where nothing else seems to work, make the basis of your story about something inanimate (a utensil, a piece of machinery, a book, music, or even food ingredients), or a historical figure who plays well into a food theme. Melman has reached a level of success in part due to his love of telling stories through his concepts. Through my experience, his company does an exceptional job in maintaining that story through physical plant, ambience, server training, menu development and product execution. It is the “story” that allows his restaurants to avoid “commodity” designation and maintain a high level of success. This is not to say that every restaurant needs to appear like a theme park enterprise, quite contrary, many of his fine dining operations are able to reflect this story without taking on the role of “strictly for tourists”. Other chefs and restaurateurs have accomplished the same with a much more subtle approach. Gavin Kaysen’s Spoon and Stable in Minneapolis pays homage to the building the restaurant calls home (once a stable) and his passion for collecting spoons from restaurants he has visited. Both simple connections create a storyline that can be portrayed to guests. Thomas Keller’s French Laundry speaks to the Yountville buildings history as a laundry operation and his roots in classic French cooking. Danny Meyer’s commitment to style, art, and interpretation are evident in The Modern, a fine dining restaurant in the middle of New York’s Museum of Modern Art. The historical Union Oyster House bleeds American history as the oldest continuous operating restaurant in the country with countless stories about past customers like John Adams and John F. Kennedy. And, the Palm Restaurants from coast to coast reflect back on the original American steakhouse that served and connected with the reporters and cartoonists of various city newspapers. Caricatures adorn the walls of each restaurant stepping back in time when cartoonists would trade artwork on the restaurant walls for a free lunch or dinner. 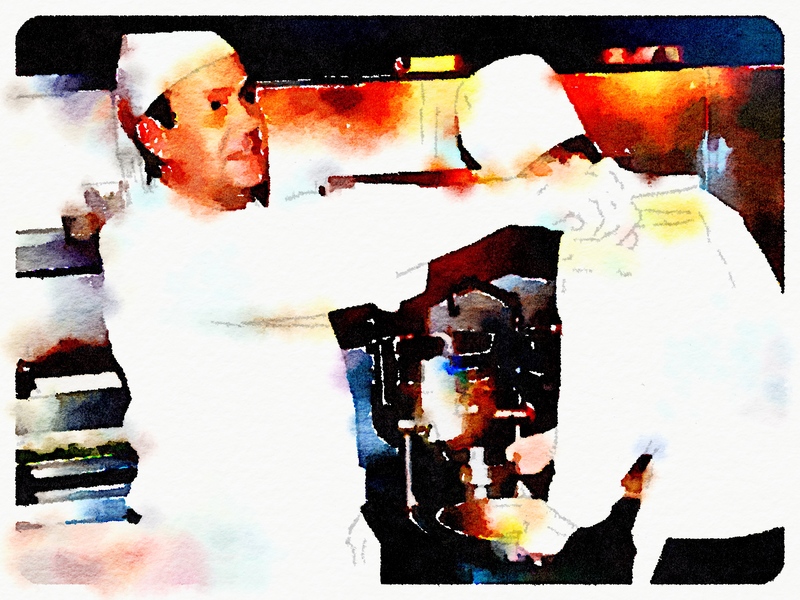 In all cases, the chef and operator has built the product, style, and reputation of the operation around the story that lies underneath. This is certainly not the only way to build a successful restaurant, but I know that the power of a good story can align employees, owners and customers to a common bond. When the story is strong, the commitment to the operation will grow. The resulting loyalty bodes well for long-term success.